Ehsan Ul Haq (2nd from right) in Bangladesh in this picture. He is no boy next door. Unlike his contemporaries in teens, his idea of fun and outlook for life are quite ‘different’. The same mindset has already taken him too far in his life than his friends. Today, Ehsan Ul Haq Boda, 16, from South Kashmir’s Shopian district has a distinction of being the ‘sport’s ambassador’ of Kashmir. A class 10 student, Ehsan is a budding Sqay Martial Art Champion of Kashmir. So far, he has represented Jammu and Kashmir at many Sub Continent level events besides at International Championships. But his raw passion for sports had to wait for proper harnessing and polishing. By 2008, Ehsan’s wait culminated. That year he met his mentor, whom he calls “Wani Sir”. Ehsan was in just in 4th standard when Wani, a technical director at Sqay Martial Arts for district Shopian spotted a spark in him. “He has been my Guru in this Sport,” Ehsan affirms. As he started playing the sports, soon his depth and skills grew. “In 2011, I got first position in Inter-District Sqay Championship held in Srinagar,” he says. But his laurels didn’t last at district level only. Soon Ehsan was selected for 1st National School Games at Goa. He performed to the best of his ability but failed to figure in top three positions. “But I didn’t complain, as for me, exposure to outside talent was much more important than anything else,” he feels. 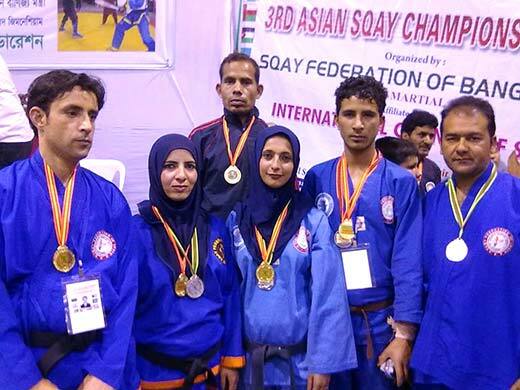 Then again in 2012, as the sports calendar resumed in Kashmir, Ehsan achieved another feather in his career by winning gold in Inter-District Sqay Martial Art Championship. Continuing his winning streak, Ehsan topped state level Championship in the same year held in Saffron town of Pampore. He later ended up winning gold. “Seven students from Jammu and Kashmir were selected for National Sqay Martial Art which was held in Maharashtra,” he informs. “Five of us won medals including me.” He won gold in the event. This event was his starting point to step in international sports. Soon as he won laurels in Maharashtra event winning gold medal at Sub Continnt level, his name figured in the list of sportsperson who were selected for 3rd Asian Championship which was held in Bangladesh. “It was a delightful journey,” Ehsan says. His earlier trips to mainland India helped him a lot to understand sports at such levels, he says. “We were 22 students from India and I was representing Kashmir,” he informs. “We had a good time in Bangladesh. It was a good learning experience.” At the conclusion ceremony, Ehsan was declared second and clinched silver medal. Then, again the same year, Ehsan got through trials and was selected for National School Games-2012 in Delhi under 19 category. He finished the event by clinching silver. “Sports have been my passion and I shall continue to work hard in this field,” he says. However, he says that there is lot to be done for sports development in Kashmir. “We need infrastructure and our game needs a good ventilated indoor stadium. At least, we should have two to three only in valley,” he says. This year, Ehsan was selected for International Coaching Camp which was held in Pahalgam. “It was very hard camp and candidates from mainland India also participated in it,” he informs. This camp was held to select sportsmen to participate in Junior World Sqay Championship to be held in Srilanka next month. And Ehsan has been selected to represent J&K state besides others from mainland India. This would be his second trip to any other SAARC nation. Youngest among his siblings, Ehsan’s father is a seasoned orchardist. Among his five sisters who are all educated and one of them having completed Hafiz (memorizing holy Koran), Ehsan’s elder brother is a shopkeeper who manages their domestic things.